Delta Marine and Caterpillar Financial Services are working together to complete Project Monarch. 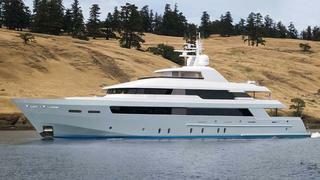 Construction of this 46m motor yacht began at Northern Marine in Anacortes and will be completed at Delta's yard in Seattle, with financing provided by Caterpillar. With exterior styling and interior design by Jonathan Quinn Barnett, this superyacht will have a full beam master suite on the main deck, along with three doubles and a twin stateroom below. Powered by twin Caterpillar 3512 B series engines, she can reach speeds up to 21 knots, with a range of 3,000 nautical miles at 12 knots. ABS classed and MCA compliant, Project Monarch has extra wide doors and a centrally located elevator for easy wheelchair access.